I have been using these pres since 2007 and I love them! Lets put them in a new home. I have tried to post all that I know about the units below. A12 is a API 312 clone. 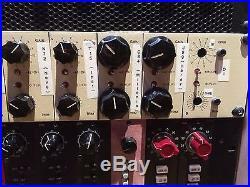 N72is a Neve 1072 clone. T15 is designed are around The amazing THAT Corporation 1512 and 1646 IC. C84 is Millennia Like design! J99 is like the John Hardy 990. D11 2 DIs: I dont recall if I put the. API 1: As you can see I have a larger collection of API pres. API 2 One of my engineers reported a "buzz" issue recently but has worked well for years. As you know, the buzz could have been anything from the mic to the converter but I just woant to tell you all that I know. I sent this back to Tim Ryan at Seventh Circle Audio. He Rewired the input transformer. Trimmed and re-terminated the output transformer he also, Adjusted the bias and verified distortion and frequency response to spec. 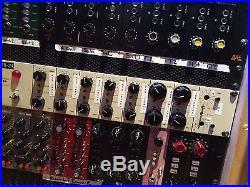 Neve 2: Sound good too but the staff has frequently reported that is not a reliable channel. For what it is worth, Tim repaired my other unit for 50bucks in 2007. I would send this to him and get it sorted out. Built by Built by Tim Ryan at Seventh Circle Audio. I'll miss this the most! T15: Great headroom and transparent sound! J99: This was sent back to Built by Tim Ryan at Seventh Circle Audio in 2007 and repaired by him in 2011. Works well and sounds great! No transformer install if I recall correctly. Unless noted, these were build by me or my staff. The C84, J99, and N72 were built by Tim at Seventh Circle Audio. The item "Seventh Circle Audio Mic Pre" is in sale since Monday, August 15, 2016. This item is in the category "Musical Instruments & Gear\Pro Audio Equipment\Preamps & Channel Strips". The seller is "owencurtin" and is located in Lexington, Massachusetts. This item can be shipped to United States.